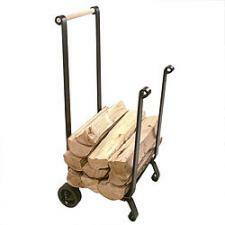 *Heavy duty wood cart with wheels. *Measures 40" High x 15" Wide x 19" Deep - Front stands 26" High. *Constructed of 7/16 x 1" heavy wrought iron bar stock and weights 18 lbs. Please call 1-800-260-8075 or email us.